They say that parenting is a balancing act. Parenting J & J is more like, happily, walking a tight rope. Jude’s needs are fairly obvious. Jane, is a bit more coy with her needs. We gotta pay attention, a lot of attention. She has to put up with a lot for her age. It’s very easy for me (who she calls Sarah vs. Mom – more on that later) to slip into “Just Jude” mode at the start of a given week. We have therapy and doctor appointments, and spend countless hours on the phone with insurers, support services and arranging sitters for Jane. For the better part of the past year, Baby Jude’s needs have become paramount in our family. His weekly schedule is set at Akron Children’s and Summit Developmental Disabilities (DD) Board. His routine at home is on point, too. Many of his daily living activities (bath, feeding, offering new foods- thank you, Sensory Processing Disorder . . . more on that later, LOTS more on that!) require prep work and, then, downtime for calming. It is dangerously easy to keep up his routine and gloss over what may be missing in Jane’s life. You see, she just turned 4. And in the last 6 months of those 4 epic years, her life changed DRAMATICALLY. She got a baby brother she didn’t anticipate. She stopped going to pre-school with tons of friends in favor of home, me, Baby Jude and the aforementioned schedule. She can name EVERY single doctor and therapist we see. She knows his exercise routines. She could act as my personal GPS on the way to the hospital. Jane has accepted Vance’s new work hours (a promotion to move the family forward … even though the hours are a bear) and she has not complained. See, it can be easy to slip into “Just Jude” mode. I made an executive decision to mark her 4th birthday in fitting fashion . This week is “Just Janey Week-” (yes, we are still maintaining all of Baby Jude’s appointments). Monday – solo trip with Dad to Lowes (yes, she is a tad obsessed with home improvement stores, and yes, I know how odd it may seem) and the library. Tuesday – she has a “big girl” hair appointment to get dolled up. Wednesday – a play date with one of her besties, Cody, at the only place on earth where a giant mechanical mouse and Purell can co-exist (NEED to co- exist) – Chuck E. Cheese. Thursday – the zoo with dear pals. Friday . . . an overnight with an Aunt, maybe? And, Saturday? Jane’s celebrating her 4th year in Cowgirl style – a cookout at home, a couple of surprises are up my sleeve, too! The best part of “Just Janey Week” so far? Vance said that, today, they were about to head home from the store when she saw an alligator toy. She asked; he said yes. Then, she spotted a light- up spinning toy. And that is the perfect kind of toy for Baby Jude, the kind of toy he will go rabid for (part of his Low Vision impairment – more on that later, too!) Without being asked, prompted or coerced, our Janey asked if she could put back the alligator -the alligator she wanted – so she could buy the light-up, spinning toy to give to Baby Jude. 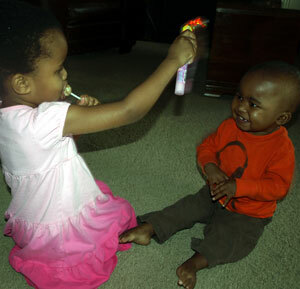 She brought her brother a toy as a gift, and Vance bought her a lollipop, as a reward. Jane + 1 reward lollipop + a shopping date with Dad +1 simple, light-up, spinning toy as a gift = a reminder for all 4 of us what it means to be Grateful, Prayerful & Hopeful. Love your post and your picture! I didn’t know you were a blogger. Hi Angela- I didn’t know I was a blogger, either, until I was! Lindsey- wow- good to hear from you!! Please tell Joan hi from her Janey Bug . . we STILL call her that!